Same story different setting. The Marked Ones tells the story of several friends who have to battle that dang Paranormal Activity coven. The jerky witches are at it again and their never ending quest of standing around looking menacing has become boring. The world of white bread witches blending with Mexican mysticism could have added a new wrinkle to the battle of good vs. evil vs. static camera. However, it can’t avoid all of the same traps and returns to the well once again. The best parts of the film are the naturalistic performances, change of scenery and usage of GoPros. Gone are the big houses and we are welcome into the world of apartment living in Oxnard, California. Our three heroes are recent high school grads who get entangled in witches, blood eggs, obligatory basements and mysticism. The kids have potential and are likable but the script fails them as the stock scares add up to laughable heights. You know the creators have stopped trying when there is a ten minute segment involving a scantily clad woman and a predictable scare. The scene does nothing to further the film and instead plays off every horror cliché in the history of the planet. You hope naively that the freshness of the first film will return and a new menace will appear. Will the two forces battle? Will Toby the pesky demon meet his match? Nope. You get the same stuff with a different cast. People are marked, the camera goes everywhere and it ends exactly like the third and fourth film. Cut, paste and make millions in box office off of a tiny budget. The insult to horror lovers is the director/writer had a chance to bring back the innovation and make tons of money. However, unlike Final Destination 5 which felt fresh you get dumb villains and recycled plots points. The original Paranormal Activty featured a bad guy who was mysterious, dangerous and brutal. I remember the simple shot of footprints put me on edge because it was so minimal. Less is more in horror. The static camera and aura of evil scared the crap out of audiences and the movie made tons of money. However, nothing gold can stay and the series has been strip mined of everything that made it good (Read horror czars review of the series here). The evil has been explained and good villains have been replaced by stereotypical witches whom offer nothing in the way of excitement. The finale of Marked Ones is a groan fest that becomes unintentionally funny. I never thought I’d see a screaming witch get blown away by a shotgun toting gang member. The way in which the women sneak around in the beginning is betrayed in the finale as they scream and run while holding knives over their heads. All their mysterious work culminates in twenty feet of running and yelling? The whole thing felt lazy and it made me think of this scene from Austin Powers. You get to a point in your life when you tire of jerky witches and the evil things they do to people. You also grow tired of the same stock ending of creepy women surrounding a house whilst our heroes questionably lock themselves inside it. What brought me back to the dying series was the change of scenery and hope for something new. New = Money. The same = diminishing returns. The creators have ignored the newness and the box office has dropped. The films are profitable but imagine how much money they’d make if they were better. 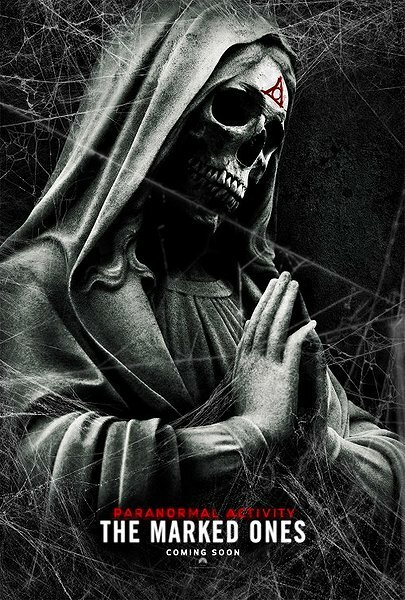 Paranormal Activity: The Marked Ones is a simple cash grab that could have expanded upon its world via Mexican mysticism. However, it brings back those dang witches and the pesky Toby. Don’t watch it. Rent the original. Or check out Troll Hunter. It has nothing to do with witches but it is original and fun. Nice witty review. I didn’t even like the original so I am assuming I wont like this Spanish version either. It wasn’t terrible, but I will say that this franchise is getting a bit too stale. Even for a dedicated-fan like myself. Good review.